"Great Shop! Great family! Don't like it, love it! The shop has always had everything you need and even more that you want. If you wanna get wet go see these guys!!!" "Awesome shop and crew!! Really helpful, competitive, flexible, knowledgeable." "Fantastic service and a great range of products. Amazingly helpful, sorted me straight out and got me on the water. Prices are better than internet. Brilliant to deal with." "Picked up my kayak today after speaking to Aaran over the phone, and I couldn't be happier! Definitely worth buying local, super super helpful with really great prices." 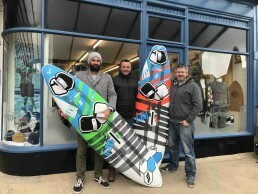 Earth Wind & Water is run by experienced windsurfer Aaran Williams and is based in Shanklin on the Isle of Wight. Aaran has been hooked on water sports since just 5 years old, learning the ropes at his family’s water sports centre, along with brothers Scott Gardner (Wight Water Adventure Watersports) and professional windsurfer Ross Williams (GBR83). Over the next 20+ years, Aaran spent as much time as he could on the water, developing his windsurfing skills, competing both nationally and internationally, and even winning a few trophies! As Manager of Offshore Sports, Aaran built on his technical and industry knowledge, fast becoming the go-to-guy for all water sports equipment enquiries here on the Island. Now owner of Earth Wind & Water, Aaran has grown a strong following of loyal customers who look to him to provide all the latest information and expert advice, along with an extensive range of equipment from top quality brands. Whether you are a beginner or seasoned pro, we have everything you need to get you out on the water!